Hi. My name is Jonathan. I’m a Christian and I do my quiet time… at night. The other night while reading the Bible before bed, I ran across a crazy story that I’d forgotten about. I screen shot it and put it on Instagram because I thought it was funny. What are the most interesting things people may not know are in the Bible? 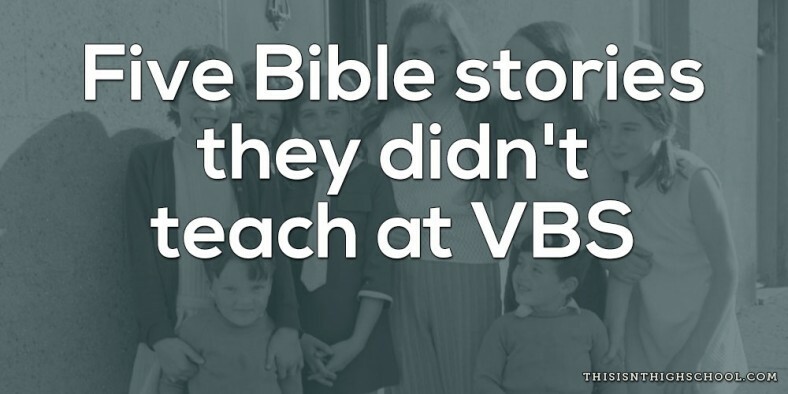 While this list is not exhaustive, and there are a ton of crazy things we never talk about, here’s my list of five Bible stories they didn’t teach at VBS. Elisha turned around and looked at them, and he cursed them in the name of the Lord. Then two bears came out of the woods and mauled forty-two of them. Elisha – one of the most prolific prophets in the entire Bible – got mad at people making fun of him. In return, he cursed them and then had bears attack them. Is that not completely awesome? I’d love to have the ability to do that. You must have a designated area outside the camp where you can go to relieve yourself. Each of you must have a spade as part of your equipment. Whenever you relieve yourself, dig a hole with the spade and cover the excrement. The camp must be holy, for the Lord your God moves around in your camp to protect you and to defeat your enemies. He must not see any shameful thing among you, or he will turn away from you. Let me put this in normal terms: If you need to poop, you must dig a hole, poop in the hole, and then cover it up because God walks around your camp and can’t see your poop. In other words, God invented porta potties. So here’s the scene: Saul goes into a cave to use the bathroom. What he doesn’t know is that David – who he is basically at war with – is already in that cave. David’s men tell him to go kill Saul while he’s using the bathroom. Instead of killing him, David walked up and cut off part of his robe. And Saul didn’t even notice! How intense is that poop if David is able to cut off part of Saul’s clothes without him even noticing?! I’ve had bad Mexican food before, but I can’t imagine not noticing someone cutting off my shirt while sitting on the toilet. At that moment the curtain in the sanctuary of the Temple was torn in two, from top to bottom. The earth shook, rocks split apart, and tombs opened. The bodies of many godly men and women who had died were raised from the dead. They left the cemetery after Jesus’ resurrection, went into the holy city of Jerusalem, and appeared to many people. Jesus died and Uncle Jimmy who died five years ago showed up at Starbucks. How freaking weird is that? Those are my five Bible stories they didn’t teach at VBS. What’s something you’ve found that never get talked about? Yesterday I totaled my car. Today I need your help.